Ebola virus (see the image below) is one of at least 30 known viruses capable of causing viral hemorrhagic fever syndrome. The genus Ebolavirus is currently classified into 5 separate species: Sudan ebolavirus, Zaire ebolavirus, Tai Forest (Ivory Coast) ebolavirus, Reston ebolavirus, and Bundibugyo ebolavirus. The 2014 outbreak of Ebola virus disease in West Africa, involving Zaire ebolavirus, was the largest outbreak of Ebola virus disease in history. Ebola virus. Courtesy of the US Centers for Disease Control and Prevention. Physical findings depend on the stage of disease at the time of presentation. With African-derived Ebolavirus infection, there is an incubation period (typically 3-8 days in primary cases and slightly longer in secondary cases). Supportive therapy with attention to intravascular volume, electrolytes, nutrition, and comfort care is of benefit to the patient. Such therapy must be administered with strict attention to barrier isolation; all body fluids contain infectious virions and should be handled with great care. No specific therapy is available that has demonstrated efficacy in the treatment of Ebola hemorrhagic fever. In those patients who do recover, recovery often requires months, and delays may be expected before full resumption of normal activities. Weight gain and return of strength are slow. Ebola virus continues to be present for many weeks after resolution of the clinical illness. Although some of the hemorrhagic fever viruses are normally spread by ticks or mosquitoes, all but one (ie, dengue hemorrhagic fever) are capable of being spread by aerosols, and this capability makes these viruses potential bioterrorism agents. The family Filoviridae resides in the order Mononegavirales and contains the largest genome within the order. This family contains 2 genera: Ebolavirus (containing 5 species) and the antigenically distinct Marburgvirus (containing a single species). Studies have demonstrated that patients who die of Ebola viral infection do not develop a humoral immune response. However, in survivors neutralizing antibody can be detected. It is likely that a broad humoral immune response can increase the likelihood of an infected patient surviving Ebola. Currently, no specific therapy is available that has demonstrated efficacy in the treatment of Ebola hemorrhagic fever, and there are no commercially available Ebola virus vaccines. (See Treatment.) General medical support is critical. Care must be administered with strict attention to barrier isolation. Because the source of Ebola virus is unknown, education and prevention of primary cases is problematic. Education of communities at risk, especially healthcare workers, can greatly reduce the number of secondary person-to-person transmissions. 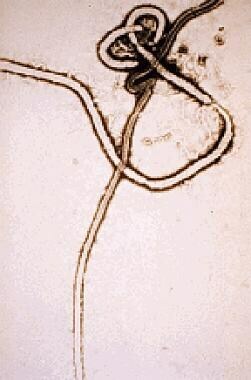 Filoviruses such as Ebola virus share a characteristic filamentous form, with a uniform diameter of approximately 80 nm but a highly variable length. Filaments may be straight, but they are often folded on themselves (see the image below). Ebola virus has a nonsegmented negative-stranded RNA genome containing 7 structural and regulatory genes. The Ebola genome codes for 4 virion structural proteins (VP30, VP35, nucleoprotein, and a polymerase protein [L]) and 3 membrane-associated proteins (VP40, glycoprotein [GP], and VP24). The GP gene is positioned fourth from the 3′ end of the 7 linearly arranged genes. After infection, human and nonhuman primates experience an early period of rapid viral multiplication that, in lethal cases, is associated with an ineffective immunologic response. Although a full understanding of Ebola virus disease must await further investigations, part of the pathogenesis has been elucidated. The sGP binds to neutrophil CD16b, a neutrophil-specific Fc g receptor III, and inhibits early neutrophil activation. The sGP also may be responsible for the profound lymphopenia that characterizes Ebola infection. Thus, sGP is believed to play pivotal roles in the ability of Ebola to prevent an early and effective host immune response. One hypothesis is that the lack of sGP production by Marburg virus may explain why this agent is less virulent than African-derived Ebola virus. Leroy et al reported their observations of 24 close contacts of symptomatic patients actively infected with Ebola. Eleven of the 24 contacts developed evidence of asymptomatic infection associated with viral replication. Viral replication was proven by the authors’ ability to amplify positive-stranded Ebola virus RNA from the blood of the asymptomatic contacts. A detailed study of these infected but asymptomatic individuals revealed that they had an early (4-6 days after infection) and vigorous immunologic response with production of interleukin (IL)–1β, IL-6, and tumor necrosis factor (TNF), resulting in enhanced cell-mediated and humoral-mediated immunity. In patients who eventually died, proinflammatory cytokines were not detected even after 2-3 days of symptomatic infection. A second, somewhat larger (120-150 kd) GP, transmembrane glycoprotein, is incorporated into the Ebola virion and binds to endothelial cells but not to neutrophils. Ebola virus is known to invade, replicate in, and destroy endothelial cells. Destruction of endothelial surfaces is associated with disseminated intravascular coagulation, and this may contribute to the hemorrhagic manifestations that characterize many, but not all, Ebola infections. Clinical infection in human and nonhuman primates is associated with rapid and extensive viral replication in all tissues. Viral replication is accompanied by widespread and severe focal necrosis. The most severe necrosis occurs in the liver, and this is associated with the formation of Councilman-like bodies similar to those seen in yellow fever. In fatal infections, the host’s tissues and blood contain large numbers of Ebola virions, and the tissues and body fluids are highly infectious. The 5 Ebolavirus species were named for the locations where they caused documented human or animal disease. Two African species, Sudan ebolavirus and Zaire ebolavirus, have been responsible for most of the reported deaths. Clinical disease due to African-derived Ebola virus is severe and, with the exception of a patient who survived infection with a third African species, Ivory Coast ebolavirus, is associated with a mortality ranging from 65% (Sudan, 1979) to 89% (Democratic Republic of the Congo [DRC], December 2002 to April 2003). A fourth Ebolavirus species, Reston ebolavirus, was first isolated in 1989 in monkeys imported from a single Philippine exporter. A virtually identical isolate imported from the same Philippine exporter was detected in 1992 in Siena, Italy. To date, this species has not been documented to cause human disease. Between 1994 and 1997, a stable strain of Ebola virus caused 3 successive outbreaks of hemorrhagic fever in Gabon (mortality, 60-74%). Because the Gabon strain shares a greater than 99% homology of the nucleoprotein and GP gene regions with Zaire ebolavirus, it has not been considered a distinct species. A likely reservoir for filoviruses has been identified. In 1996, members of the National Institute for Virology of South Africa went to Kikwit, DRC, and evaluated the infectivity of Ebola virus for 24 species of plants and 19 species of vertebrates and invertebrates. Insectivorous bats and fruit bats were found to support Ebola virus replication without dying. Furthermore, serum Ebola titers in infected fruit bats reached as high as 106 fluorescent focus-forming units/mL, and feces contained viable Ebola virus. Dogs have been shown to acquire asymptomatic Ebola virus infections, possibly by contact with virus-laden droplets of urine, feces, or blood of unknown hosts. Of epidemiologic significance was the observation that seroprevalence rates in dogs rose in a linear fashion as sampling approached areas of human cases, reaching as high as 31.8%. Thus, an increase in canine seroprevalence may serve as an indicator of increasing Ebola virus circulation in primary vectors within specific geographical areas. Human infection with African-derived strains has often occurred in caregivers (either family or medical) and in family members who have prepared dead relatives for burial. Late stages of Ebola virus disease are associated with the presence of large numbers of virions in body fluids, tissues, and, especially, skin. Individuals who are exposed to patients infected with Ebola without proper barrier protection are at high risk of becoming infected. A report from the DRC identified Ebola virus RNA in 100% of oral secretions from patients who had the viral RNA in their serum. Both serum and oral secretions were tested with reverse-transcriptase polymerase chain reaction (RT-PCR) assay. Thus, oral secretions may be capable of transmitting Ebola virus. The first recorded outbreak occurred in 1976, in Yambuku, DRC, where 316 patients were infected. In the largest recorded urban outbreak to date (DRC, 1995; 318 cases), admission to a hospital greatly amplified the frequency of transmission. The lack of proper barrier protection and the use and reuse of contaminated medical equipment, especially needles and syringes, resulted in rapid nosocomial spread of infection. Only after adequate barrier protection and alteration in burial rituals were implemented was the outbreak contained. Unlike Asian-derived Ebola virus (ie, Reston ebolavirus, traced to a Philippine supplier of primates), African-derived species appear to be spread more often by direct contact than via the respiratory route. However, the Reston species has repeatedly been demonstrated to spread among nonhuman primates and possibly from primates to humans via the respiratory route. Fortunately, although the Reston species has been documented to be capable of infecting in humans, it does not appear to be pathogenic to humans. Before the 2014 outbreak, several human infections with the Reston strain of Ebola had been acquired by animal care workers at primate holding facilities within the United States. Fortunately, the Reston strain has not demonstrated pathogenic effects in humans. Others at potential risk are laboratory workers who work with infected animals or with the virus in tissue culture. Ebola and Marburg viruses are responsible for well-documented outbreaks of severe human hemorrhagic fever, with resultant case mortalities ranging from 23% for Marburg virus to 89% for Ebola virus in which more than one case occurred (see Tables 1, 2, 3, 4, and 5 below). Data from Centers for Disease Control and Prevention and World Health Organization. * Occurred after laboratory accident. Proven * Cases Reported, No. * Humans with serologic evidence of infection but without clinical disease. In the 1995 outbreak in Kikwit, DRC, infection rates were significantly lower in children than in adults. During this outbreak, only 27 (8.6%) of the 315 patients diagnosed with Ebola virus infection were aged 17 years or younger. This apparent sparing of children occurs even though 50% of the population of the DRC is younger than 16 years. Although definitive evidence is lacking, epidemiologic evidence suggests that children are less likely to come into direct contact with ill patients than adults are. Other viral hemorrhagic syndromes, such as Crimean-Congo hemorrhagic fever and hantavirus infections, also show a predominance of adult patients and a relative sparing of young children. Ebola virus infection has no sexual predilection, but men and women differ with respect to the manner in which direct exposure occurs. Men, by the nature of their work exposure in forest and savanna regions, may be at increased risk of acquiring a primary infection from gathering “bush meat” (primate carcasses) for food, as well as an unknown vector or vectors. Evidence from Africa and the Philippines is compatible with bats being a principal vector of Ebola virus. Because women provide much of the direct care for ill family members and are involved in the preparation of the bodies of the deceased, they may be at increased risk of acquiring Ebola virus infection through their participation in these activities. However, men and women who are medical healthcare providers seem to share a high and equal risk of infection. Because most cases of Ebola virus infection have occurred in sub-Saharan Africa, most patients have been black. However, no evidence exists for a specific racial predilection. The overall prognosis for patients with Ebola virus infection is poor. However, those who survive for 2 weeks often make a slow recovery. With the exception of the Reston strain, Ebola virus is associated with very high morbidity and mortality among patients who present with clinical illness, though these vary according to the causative species. The most highly lethal Ebolavirus species is Zaire ebolavirus, which has been reported to have a mortality rate as high as 89%. Sudan ebolavirus also has high reported mortality, ranging from 41% to 65%. World Health Organization. Preliminary results on the efficacy of rVSV-ZEBOV-GP Ebola vaccine using the ring vaccination strategy in the control of an Ebola outbreak in the Democratic Republic of the Congo: an example of integration of research into epidemic response. WHO. Available at https://www.who.int/csr/resources/publications/ebola/ebola-ring-vaccination-results-12-april-2019.pdf?ua=1. April 12, 2019; Accessed: April 17, 2019. Mole B. As Ebola outbreak rages, vaccine is 97.5% effective, protecting over 90K people. ARS Technica. Available at https://arstechnica.com/science/2019/04/ebola-vaccine-is-97-5-effective-early-outbreak-data-suggests/. April 16, 2019; Accessed: April 17, 2019. Hensley LE, Stevens EL, Yan SB, et al. Recombinant human activated protein C for the postexposure treatment of Ebola hemorrhagic fever. J Infect Dis. 2007 Nov 15. 196 Suppl 2:S390-9. [Medline]. Geisbert TW, Hensley LE, Jahrling PB, et al. Treatment of Ebola virus infection with a recombinant inhibitor of factor VIIa/tissue factor: a study in rhesus monkeys. Lancet. 2003 Dec 13. 362(9400):1953-8. [Medline]. Sanchez A, Trappier SG, Mahy BW, Peters CJ, Nichol ST. The virion glycoproteins of Ebola viruses are encoded in two reading frames and are expressed through transcriptional editing. Proc Natl Acad Sci U S A. 1996 Apr 16. 93(8):3602-7. [Medline]. Leroy EM, Baize S, Volchkov VE, et al. Human asymptomatic Ebola infection and strong inflammatory response. Lancet. 2000 Jun 24. 355(9222):2210-5. [Medline]. Roddy P, Howard N, Van Kerkhove MD, et al. Clinical manifestations and case management of Ebola haemorrhagic fever caused by a newly identified virus strain, Bundibugyo, Uganda, 2007-2008. PLoS One. 2012. 7(12):e52986. [Medline]. [Full Text]. Amblard J, Obiang P, Edzang S, Prehaud C, Bouloy M, Guenno BL. Identification of the Ebola virus in Gabon in 1994. Lancet. 1997 Jan 18. 349(9046):181-2. [Medline]. Swanepoel R, Leman PA, Burt FJ, et al. Experimental inoculation of plants and animals with Ebola virus. Emerg Infect Dis. 1996 Oct-Dec. 2(4):321-5. [Medline]. Johnson E, Jaax N, White J, Jahrling P. Lethal experimental infections of rhesus monkeys by aerosolized Ebola virus. Int J Exp Pathol. 1995 Aug. 76(4):227-36. [Medline]. Allela L, Boury O, Pouillot R, et al. Ebola virus antibody prevalence in dogs and human risk. Emerg Infect Dis. 2005 Mar. 11(3):385-90. [Medline]. Dokubo EK, Wendland A, Mate SE, et al. Persistence of Ebola virus after the end of widespread transmission in Liberia: an outbreak report. Lancet. Jul 2018. World Health Organization. New Ebola outbreak declared in Democratic Republic of the Congo. World Health Organization. Available at https://www.who.int/news-room/detail/08-05-2018-new-ebola-outbreak-declared-in-democratic-republic-of-the-congo. May 8, 2018; Accessed: May 9, 2018. Neuman S. Congo Declares New Ebola Outbreak After 2 Confirmed Cases. NPR. Available at https://www.npr.org/sections/thetwo-way/2018/05/09/609640513/congo-declares-new-ebola-outbreak-after-2-confirmed-cases. May 9, 2018; Accessed: May 9, 2018. Miles T. Ebola outbreak in Congo 'largely contained', says WHO. Reuters. June 20, 2018. Available at https://www.msn.com/en-us/health/medical/ebola-outbreak-in-congo-largely-contained-says-who/ar-AAyTLDF. Centers for Disease Control and Prevention (CDC). 2014 Ebola Outbreak in West Africa. Centers for Disease Control and Prevention (CDC). Available at http://www.cdc.gov/vhf/ebola/outbreaks/guinea/. Accessed: September 4, 2014. Baize S, Pannetier D, Oestereich L, et al. Emergence of Zaire Ebola Virus Disease in Guinea - Preliminary Report. N Engl J Med. 2014 Apr 16. [Medline]. Wilson J. Peace Corps evacuates west Africa volunteers due to Ebola threat. CNN. Available at http://www.cnn.com/2014/07/30/health/ebola-american-aid-workers/index.html?hpt=hp_t1. Accessed: July 30, 2014. Alsop Z. Ebola outbreak in Uganda "atypical", say experts. Lancet. 2007 Dec 22. 370(9605):2085. [Medline]. Barrette RW, Metwally SA, Rowland JM, et al. Discovery of swine as a host for the Reston ebolavirus. Science. 2009 Jul 10. 325(5937):204-6. [Medline]. Shoemaker T, Macneil A, Balinandi S, et al. Reemerging Sudan ebola virus disease in Uganda, 2011. Emerg Infect Dis. 2012 Sep. 18(9):1480-3. [Medline]. [Full Text]. Abutaleb Y. U.S. FDA Issues Emergency Authorization for Two New Ebola Tests. Medscape. Oct 28 2014. [Full Text]. Geisbert TW, Jahrling PB. Differentiation of filoviruses by electron microscopy. Virus Res. 1995 Dec. 39(2-3):129-50. [Medline]. Huggins J, Zhang ZX, Bray M. Antiviral drug therapy of filovirus infections: S-adenosylhomocysteine hydrolase inhibitors inhibit Ebola virus in vitro and in a lethal mouse model. J Infect Dis. 1999 Feb. 179 Suppl 1:S240-7. [Medline]. Smith LM, Hensley LE, Geisbert TW, et al. Interferon-ß Therapy Prolongs Survival in Rhesus Macaque Models of Ebola and Marburg Hemorrhagic Fever. J Infect Dis. 2013 Jan 15. [Medline]. Baranovskiy AG, Babayeva ND, Suwa Y, Gu J, Pavlov YI, Tahirov TH. Structural basis for inhibition of DNA replication by aphidicolin. Nucleic Acids Res. 2014 Dec 16. 42 (22):14013-21. [Medline]. [Full Text]. Kota KP, Benko JG, Mudhasani R, Retterer C, Tran JP, Bavari S, et al. High content image based analysis identifies cell cycle inhibitors as regulators of Ebola virus infection. Viruses. 2012 Sep 25. 4 (10):1865-77. [Medline]. [Full Text]. Geisbert TW, Hensley LE, Kagan E, et al. Postexposure protection of guinea pigs against a lethal ebola virus challenge is conferred by RNA interference. J Infect Dis. 2006 Jun 15. 193(12):1650-7. [Medline]. Geisbert TW, Lee AC, Robbins M, et al. Postexposure protection of non-human primates against a lethal Ebola virus challenge with RNA interference: a proof-of-concept study. Lancet. 2010 May 29. 375(9729):1896-905. [Medline]. Iversen PL, Warren TK, Wells JB, et al. Discovery and early development of AVI-7537 and AVI-7288 for the treatment of Ebola virus and Marburg virus infections. Viruses. 2012 Nov 6. 4(11):2806-30. [Medline]. [Full Text]. Heald AE, Iversen PL, Saoud JB, et al. Safety and pharmacokinetic profiles of phosphorodiamidate morpholino oligomers with activity against ebola virus and marburg virus: results of two single-ascending-dose studies. Antimicrob Agents Chemother. 2014 Nov. 58(11):6639-47. [Medline]. [Full Text]. Qiu X, Audet J, Wong G, et al. Successful treatment of ebola virus-infected cynomolgus macaques with monoclonal antibodies. Sci Transl Med. 2012 Jun 13. 4(138):138ra81. [Medline]. Wilson JA, Hevey M, Bakken R, et al. Epitopes involved in antibody-mediated protection from Ebola virus. Science. 2000 Mar 3. 287(5458):1664-6. [Medline]. Olinger GG Jr, Pettitt J, Kim D, et al. Delayed treatment of Ebola virus infection with plant-derived monoclonal antibodies provides protection in rhesus macaques. Proc Natl Acad Sci U S A. 2012 Oct 30. 109(44):18030-5. [Medline]. [Full Text]. Pettitt J, Zeitlin L, Kim do H, et al. Therapeutic intervention of Ebola virus infection in rhesus macaques with the MB-003 monoclonal antibody cocktail. Sci Transl Med. 2013 Aug 21. 5(199):199ra113. [Medline]. Qiu X, Wong G, Fernando L, et al. mAbs and Ad-vectored IFN-a therapy rescue Ebola-infected nonhuman primates when administered after the detection of viremia and symptoms. Sci Transl Med. 2013 Oct 16. 5(207):207ra143. [Medline]. Qiu X, Wong G, Audet J, et al. Reversion of advanced Ebola virus disease in nonhuman primates with ZMapp. Nature. 2014 Oct 2. 514(7520):47-53. [Medline]. [Full Text]. Geisbert TW. Medical research: Ebola therapy protects severely ill monkeys. Nature. 2014 Oct 2. 514(7520):41-3. [Medline]. Lyon GM, Mehta AK, Varkey JB, et al. Clinical care of two patients with Ebola virus disease in the United States. N Engl J Med. 2014 Dec 18. 371(25):2402-9. [Medline]. Zhang Y, Li D, Jin X, Huang Z. Fighting Ebola with ZMapp: spotlight on plant-made antibody. Sci China Life Sci. 2014 Oct. 57(10):987-8. [Medline]. [Guideline] Centers for Disease Control and Prevention. Guidance on Personal Protective Equipment To Be Used by Healthcare Workers During Management of Patients with Ebola Virus Disease in U.S. Hospitals, Including Procedures for Putting On (Donning) and Removing (Doffing). Available at http://www.cdc.gov/vhf/ebola/hcp/procedures-for-ppe.html. Accessed: October 21, 2014. Kennedy SB, Bolay F, Kieh M, et al. Phase 2 Placebo-Controlled Trial of Two Vaccines to Prevent Ebola in Liberia. N Engl J Med. 2017 Oct 12. 377 (15):1438-1447. [Medline]. Sullivan NJ, Sanchez A, Rollin PE, Yang ZY, Nabel GJ. Development of a preventive vaccine for Ebola virus infection in primates. Nature. 2000 Nov 30. 408(6812):605-9. [Medline]. Geisbert TW, Pushko P, Anderson K, Smith J, Davis KJ, Jahrling PB. Evaluation in nonhuman primates of vaccines against Ebola virus. Emerg Infect Dis. 2002 May. 8(5):503-7. [Medline]. [Guideline] CDC. Evaluating Patients for Ebola: CDC Recommendations for Clinicians. Medscape Medical News. Oct 3 2014. [Full Text]. Centers for Disease Control and Prevention (CDC). Travel Health Notices. Centers for Disease Control and Prevention (CDC). Available at http://wwwnc.cdc.gov/travel/notices. Accessed: October 17, 2014. Fast Five Quiz: How Much Do You Really Know About Ebola Virus?